Howdy all, Trinket Ben here! 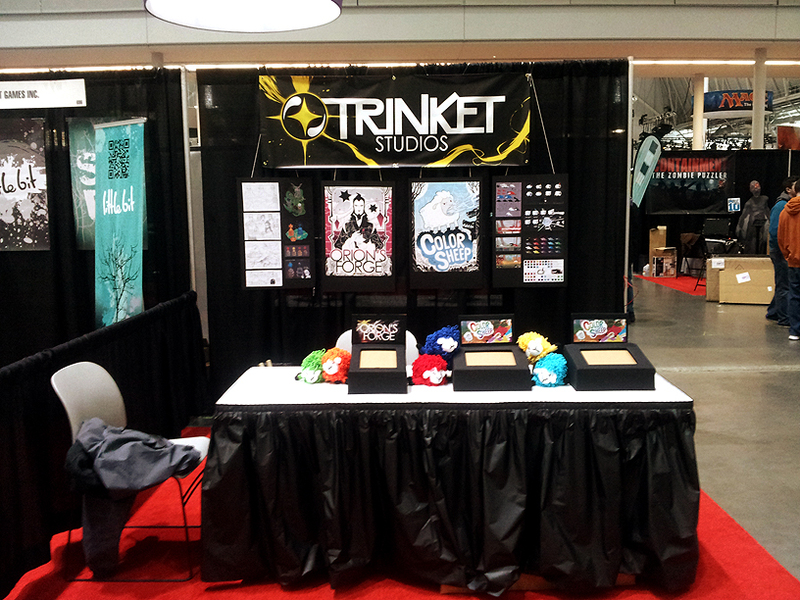 Now that Trinket Studios has two games out and a visit to PAX East under our belts, I thought I’d publish a retrospective on our expenses. Yes, we know, it’s super late! After our visit to PAX we jumped straight in on an update to Color Sheep that took about two weeks — a lot less than we budgeted for, but it also left us with little energy or bandwidth to properly document our experiences up until and through PAX. We’re finally weening off of Color Sheep work and focusing on new ideas and closing old books. Hopefully this information will be valuable to others who may be pondering the cost of starting their own company. I know I wish I had found more information like this when we started! 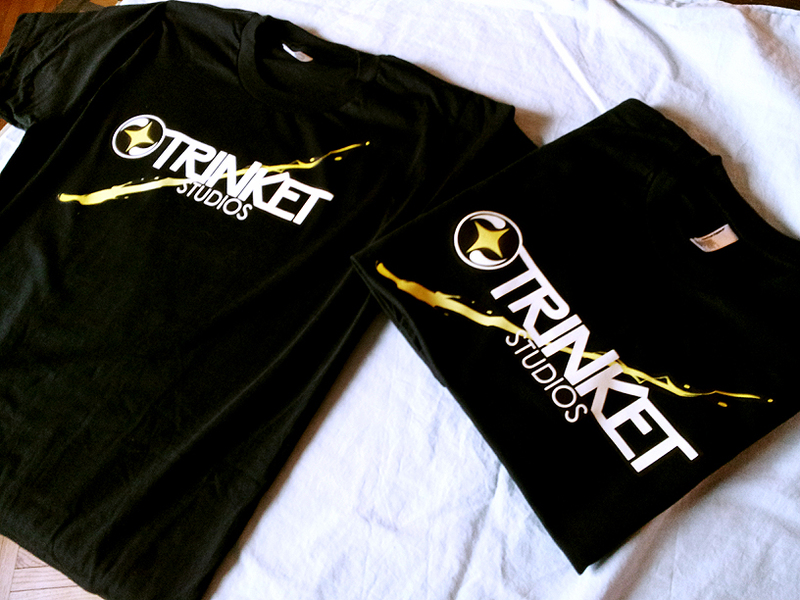 A little about us: Trinket Studios was founded August 1st, 2012. We released Color Sheep February 21st, 2013, and Orion’s Forge was released March 14th, 2013. At the close of April, we’ll have been in business for 9 months. The following list represents all of our expenses up until we began to make purchases for PAX. Won an Ouya and copy of the Adobe suite! Thanks IGDA Chicago, Ouya, Andy Saia, and Adobe! Obviously these figures exclude some numbers that exist in the hazy area between personal costs and company expenditures. We work out of Tom and Eric’s apartment, so in some ways their rent is part of our operating costs. They also pay for electricity and cable service. For my own part, I live an hour and a half away from “the office”, and so I pay about $150 monthly in public transportation. It should be clear that we’re Unity3D developers, and so we have specific expenses related to our engine of choice. It’s also worth mentioning that we purchased Pro licenses, which you may or may not necessarily need. At this point the only thing we’ve really used Pro features for was the ability to remove the default Unity splash screen, but it seems likely that our next game will be larger in scope and the ability to profile CPU and GPU bottlenecks (plus the new memory profiling that was released with 4.0!) will be invaluable. The point, however, is that you could theoretically get started developing mobile games with Unity3D for $2,300 (Pro + Android + iOS). Also, we ended up paying a lawyer to handle setting up the documents required to establish Trinket Studios as an S-Corp. Theoretically, this is an expense you can avoid if you’re confident you can wade through legal documentation (and you have the time and patience to deal with it). I believe a number of other Chicago-based indie studios opted to handle their own incorporation, so if you’re interested in looking into doing it on your own, feel free to contact us and we’ll pass you along to someone who has done it by hand. If, on the other hand, you’re in Chicago and you’re looking for an attorney with legal experience pertaining to game development, you might want to drop our lawyer Jeffery Marks a line! I also want to call out some of the equipment we use on a daily basis and which we already owned or which we purchased out of pocket. Some of this will seem obvious, but they’re possessions we need in order to work. If you’re looking to start a company and you’re missing equipment, you may have to budget for these items in the company ledger! Left to right: Eric, Ben, Tom. All the desks are Tom’s from the glass topped ones he used since high school to his new sit/standing desk. Check out our coral pink walls! There’s also a baby blue kitchen and a seafoam green living room, like a soothing beach house. All the expenses listed above happened within a few months of our company’s founding (through to December or so). Following that, we didn’t have too many company expenses — until we registered for PAX. Way cheaper than NOT being a part of IMB! Big thanks to “IMB Overlord” Kelly Wallick! Bunches left over for future events! Huzzah! We’re broke! Well, no, not really. We had some cash come in via Google and Apple for the month of February, so we ended up skirting zero balance just barely. Our Indie Megabooth set up! Later we had Tom’s laptop running a prototype on the far left, and Ben’s monitor stood on top of extra boxes on the table playing our game trailers. This was our PAX East Indie Showcase table right across from our Indie Megabooth setup. Orion’s Forge was fortunate enough to be featured alongside a selection of amazing indie games and their even more amazing developers. The large TV was provided for as well as that red sign. We were lucky enough to have 4 fantastically supportive volunteers to help us staff our two booths — Tom’s girlfriend Jen, my girlfriend, Juley, and Eric’s two brothers, David and Allen. Without them, we would have had a much harder time staying on top of everything going on at either booth, even though they were only separated by 10-20 feet. They made a world of difference in every possible way and we cannot extend our gratitude to them enough! In the figures above, we are calculating how much the company would have spent to send the three of us to Boston by plane to stay in modest hostel lodgings and eat cheaply. Theoretically, this is what we’ll try to do next time. However, for a variety of reasons, we opted to pick up some personal expenses out of our own pockets. We had four volunteers with us, but we didn’t want to put them through the sacrifices we three would be willing to make for the sake of our company. With that in mind, our lodging went from a room with three twin beds and a floor-shared bathroom to two deluxe rooms with private bathrooms and queen beds. We also opted to take cabs between our hostel and the convention center more often than we anticipated, which cost significantly more than taking public transportation. I think this ended up being a good decision, however. The convention was about 40 minutes away by public transit. Since we wanted to be at the convention center an hour before it opened (8 AM the first day and 9 AM every other day) and accounting for morning routines and breakfast, we would have had to be up almost a full hour earlier than we got up to make it by cab. It doesn’t sound like much, but when you’re standing all day and socializing all night, every extra hour of sleep counts. Some expenses ended up being reusable or one time investments. The two vinyl banners we bought will be usable for future conventions, and we have a few posters left (probably enough that we don’t need to buy more for the next outing). We also have left over business cards, so we won’t need new ones for quite a while. Finally, we’re hoping that the good quality shirts with iron-on logos will last at least a year or more if we keep them in good condition. We were also able to leverage the equipment I mentioned earlier in the post. I brought a monitor and two laptops to the convention. This, plus Tom’s laptop, enabled us to run trailers at our two booths and the demo for a game we’re considering publishing in the future. We didn’t want to simply hand people free floating iPads that could get lost or stolen, but we also didn’t want to buy expensive locking set ups. 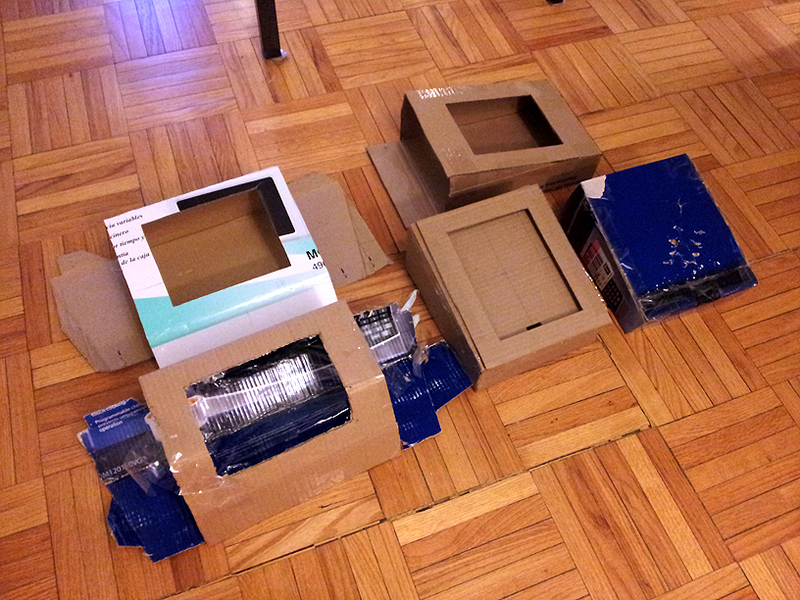 Our solution to the problem was to devise a cardboard stand into which we’d slide the iPads. Though the stands didn’t add any weight, it did mean that anyone looking to steal our devices would have to walk away with a conspicuous and large object. Moreover, building our own stands let us add more branding and attract features to the table (each stand had a back piece sporting the game’s logo). In the end the stands seem to have worked (no iPads were stolen), and they were way cheaper than buying real locks. The only thing we might change for next time is the elevation of the devices. PAX-goers had to crane their backs a bit while playing because our table didn’t have the adjustable legs that some of the other exhibitors’ tables had. Ugly prototype arcade cabinets… or spaceships. After making final templates and making clean cuts out of fresh cardboard from an art store we finally put these beautiful arcade style cabinets together at PAX. The black covering is book cloth and we made extensive use of tacky glue and tape. We commissioned our friend at NVS Art to crochet Woolson plushies for us to sell or give away at PAX. We paid $200 to have 20 plushies made but made back that investment and a bit of profit. 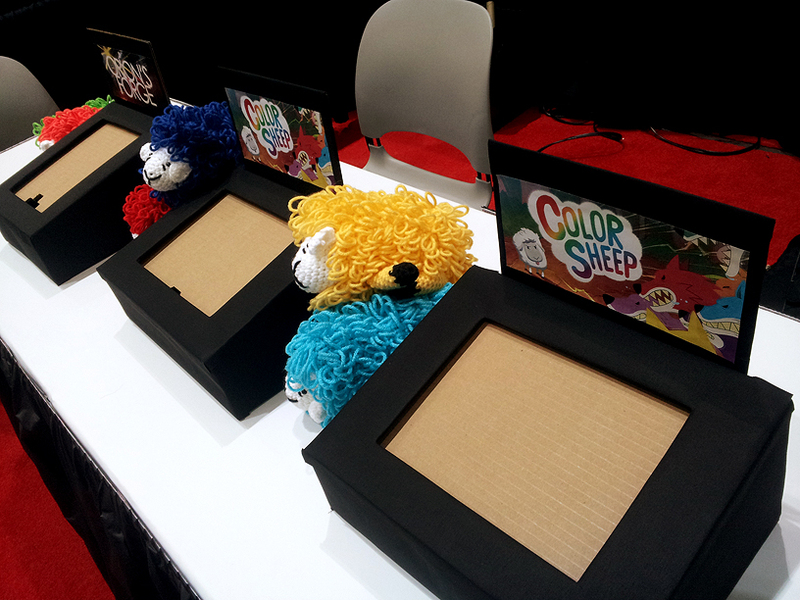 All 20 Woolsons sold, so this helped to spread word about Color Sheep, offset the cost of the convention slightly, and hopefully give NVS Art some new fans! Our Woolson plushie sign for PAX East. Eric’s awesome friend Ed helped him print out concept art to be posted on foam core board as well as all the logos for printing on iron-on paper, at no cost! After printing all the materials, the two of them cut out all the artwork, and later Eric cut out every single logo, getting into the smaller details with an x-acto knife. 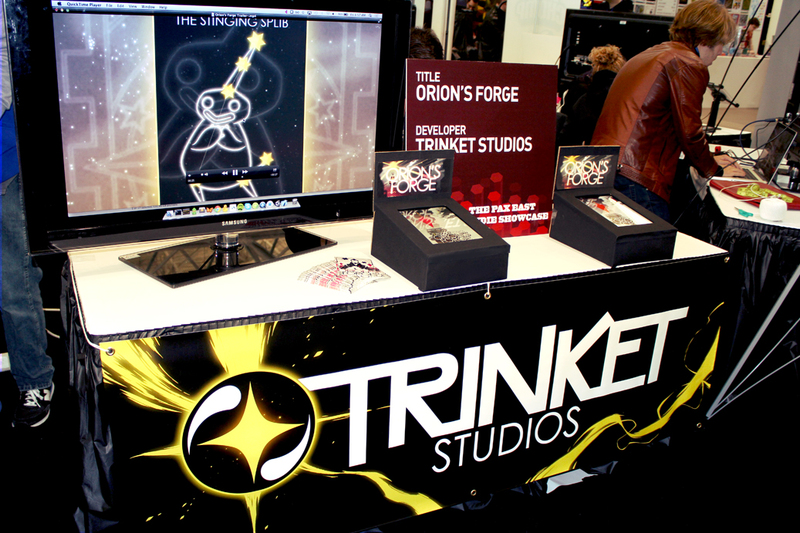 All told Trinket Studios has spent almost $10,000 to launch two mobile games and visit PAX. Some of the cost quoted above could have been lower depending on how much we had been willing to forgo with PAX materials. Also, more than half of the $10,000 is expenditures that, hopefully, we won’t have again for a long while (Unity licenses, hiring a lawyer, promotion banners). So where does that leave us? Are we in the black or in the red? Jump over to our sales report post to find out!